It’s that time of year! Oktoberfest, baby! No? Too soon? Not if you follow the typical brewing schedule of old German breweries. Oktoberfest beers, specifically Marzen were brewed in March (Marz in German means March) to be ready for the fall. This is the time of year I start getting prepared for decoction mashing. I commit to at least one decoction brew a year and it is almost always for lagers. Before we get into the specifics, let’s talk about what decoction mashing is. When brewing, there’s many ways to raise the temperature of your mash at different conversion levels. Some include direct heat to your mash, some require adding boiling water, others require removing part of the mash and heating only part of it to boiling then returning it to your mash tun. The latter is what we will focus on. The original premise of decoction mashing was to take undermodified malts and step mash at a different levels to to help with converting different enzymes, breaking down proteins, or changing mash pH. Today, almost all malts available to the homebrewer are well modified and require little to no step mashing to establish a sweet wort. Decoction mashing still has a point however: to create a unique malt profile some say isn’t possible with traditional mashing methods. The simple version is this: you get to a specified mash step (acid rest to lower mash pH , protein rest to break down proteins yielding a more clear beer, and a saccharification rest where starches are converted to sugars), hold temperature, then move to the next rest by adding the decocted or boiled mash to main mash to bring the temperature up to your next mash temperature. There’s plenty of articles available on the actual science of what goes on when you decoct a beer. I’m going to spend some time on my process to make this easier for those of you who haven’t ever done a decoction or might have struggled with your first and only decoction. I use Brewer’s Friend for a decoction calculator (https://www.brewersfriend.com/mash) to aid in figuring out how much mash to pull to help ensure I bring my mash up to the next temperature level. A good rule of thumb is that you will need to pull about ⅓ of the thickest part of the mash (as much grains as possible and a little liquid),mash and boil it for a period of time- I like to boil my mash until it feels “sticky” in the pot and then return it to the main mash (hat tip to Dino for sharing this observation with me!). Some calculators will say boil 15-20 minutes and that’s a good hard and fast basis. So depending on how many mash steps you want to incorporate in your brew day, you determine how many decoctions you want to perform (single, double, or triple decoction). The process is the same depending on how many decoctions you want to pull. If you are doing a single decoction, the typical schedule I follow is to perform a normal sacch rest between 146-158F for 45 minutes, then pull roughly ⅓ of the mash or whatever the Brewer’s Friend recommends, boil the mash until it’s sticky, return it to my mash tun and get to mash out temperature of roughly 168F and start my sparge. If I do a double decoction, I will first perform a protein rest, hold it at 130F (protein rest range is 113-138F) for 15 minutes, then pull my decoction. You want to make sure you allow the malt to go through a partial protein rest before pulling the mash. You now have to raise the pulled mashed to a short sacch rest to allow the starches to convert into sugars before boiling the mash and killing any chance of converting the starches to sugars. This usually takes 15-20 minutes for full conversion. You then raise that mash to boiling. You have to constantly stir this boiling mash so that the grains and sugars don’t scorch and taste burnt when returning them to the main mash and having a burnt tasting finished beer. After boiling the mash until sticky, I return it to the main mash to get the temperature up to the sacch rest range. Again, hold your sacch rest for 45 minutes, then pull your next decoction and get to mash out temperature. If you are doing a triple decoction, you will start with an acid rest (95-113F), pull your decoction, hold at sacch rest for 15 minutes, decoct, return your decoction to the mash, hold at protein rest and follow the double decoction schedule. Those are the basics and the schedule requirements of mashing. There are a few points to ponder and consider when doing a decoction. First: time is a huge concern. If you are doing any decoction mashing, expect to add hours to your brew day. If you’re doing a single decoction expect to add at least an hour. 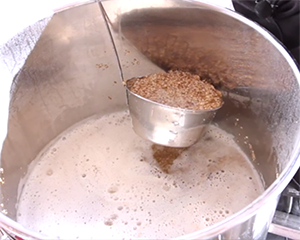 If you are doing a triple decoction, expect to add up to 4 hours to your brew day. Second, you’re going to want to have a well insulated mash tun to hold the main mash at temperature for extended periods of time or direct heat of some sort. This is where having a second person to help you is a huge stress relief. I usually employ my son to constantly stir the mash while I check in on temperature of the main mash. When I’m figuring out what temperature I want to hold at each mash step, I always hold the acid rest and the protein rest at the high end of the spectrum expecting the temperature to gradually drop while there’s an extended mash step time. The only time I don’t do this is with the sacch rest as the amount of starches converted vary greatly from the low level of the spectrum to the high end. I hold the sacch temp at a determined level to produce the amount of body I require for the style being brewed. Next, as you’re going to be boiling the mash for long periods of time, you can “cheat” by adding some boiling water to your decoction before you ramp up to boiling but after you’ve done your sacch rest. You will boil off a good portion of your water during the decoction and will be low on your overall liquid when you get back to your main mash. The process I’ve always used is to keep a pot of boiling water separate from the decoction and just top up my main mash when I return the decoction to the main mash. This serves two purposes: first, it allows you to keep your mash at the proper thickness or water to grain ratio, and second, it allows you to raise your mash temperature to the next rest temperature. When decoction brewing, I’m not sure I’ve ever reached the exact temperature I was aiming for without adding boiling water to bring my main mash to the correct temperature. Having boiling water is almost entirely necessary. Something else to consider: when you are performing a decoction mash, your brewhouse efficiency will go UP. That’s correct, you will get better efficiency and more starch conversion than you do with your normal brewday. It’s hard to say how different this number will be from person to person, but expect at least a 3 or 4 point jump in your efficiency. I typically get between 82-86% brewhouse efficiency and when I do a decoction mash, my efficiency is alway 89-91%. There is a noticeable difference here. We discussed at the beginning of the article that decoction mashes produce a different beer then you can get with traditional mashing techniques and I believe it. One of the most notable differences I find is that I can produce lagers that have a fuller body and a malt presence without being overly sweet, yet finish dry on the palate. I’ve yet to be able to produce this form of authenticity using other methods that I’ll touch on in a moment. When I brew my Oktoberfest or Pilsner, I can get a beer that is malty but not sweet yet dries out the palate on the finish for that refreshing, make you thirsty, I need another beer moment. There are ways to get close to a decoction taste in a beer. Because decoction brewing produces melanoidin- a compound that gives the sensation of a rich bready or toasty like character to foods and drinks- melanoidin malt can be used in place of decoction brewing to add a level of rich fullness to a beer without decoction mashing. The flavor is close, but not entirely the same. I’ve done side by side brews with exactly the same sacch rest temperatures and the beer using melanoidin seemed less rich and less complex to tasters than did the beer that used an authentic double decoction. It’s worth doing your own research on this for your own blind tasting. To conclude, I want to share some of my own brewing experiences with decoction mashing. The first time I had a decoction brewday, I went for it and did a triple decoction. My brewday lasted roughly 8 hours which was 3 hours longer than my normal brewday. I decided to cut out the fly sparge and batch sparge to save 45 minutes in my typical brewday. It was an Oktoberfest that I brewed in March and it was a rough day for me. I wasn’t prepared for not hitting my temperatures so I was using direct fire trying to bring up my temperature to the next step in the mash schedule. I overshot a bit because the heat got my mash temp up so quickly. I also was low on volume by the end of the mash as I had boiled off a good amount of mash liquid. After topping up and making some adjustments, I was mentally spent and needed some reflection. The final beer came out stellar though I had my sacch rest a bit too warm so the oktoberfest was sweeter than I had hoped. After reevaluating, doing a bit more reading, and some experimenting, I found a system that works for me, that’s detailed above. I typically brew lagers as I stated before, and most of my lagers, when brewed to style guidelines, should have a decent malt presence but finish medium dry to dry. I usually do a double decoction and skip over the acid rest, and once I reach the sacch rest, I mash around 148. I’ve found, for me, this produces a beer with malt presence but nowhere near cloying or out of balance. At first blush on the palate, the beer is malty and quickly gives way to the hops and a more dry beer. It’s what I shoot to accomplish with all beers like a Festbier, Oktoberfest, and German Pilsner. I’ve brewed Munich Helles and mashed my sacch rest a bit higher at 152 and enjoyed the slightest bit of residual sweetness in the beer which subdues the hops a bit more. Don’t be afraid to spend a brew day experimenting with decoction mashing, just make sure you leave yourself enough time. There are other techniques for decoction brewing that can be found on the internet, some of which I experimented with and tweaked to my own personal preference until I established a process that works for me and my brewhouse. Hopefully this tutorial can be helpful to those who want to give decoction mashing a shot. Happy brewing!